Sit down and think. What kind of room you want? Do you want a place that is going to be a social hub? Or do you want a place that can be your personal retreat? Both are perfectly ok! You just have to figure out what you want in a living space. University Housing has some great points to consider when picking a roommate. Communicate! You will notice that throughout this letter, I place special emphasis on the word communicate! This is because it is the single best thing you can do with your roommate. Communicate with your prospective roommates and be honest about what you are looking for. Believe me, they would rather you tell them what you want in June than in October. Remember, you don’t necessarily need someone who will be best friends with you; you want someone you can live with. 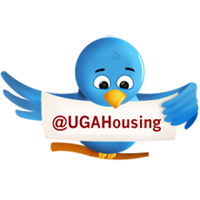 When talking to prospective roommates, ask questions about how they live. Favorite movie or color won’t matter when you can’t agree on what time the lights go out or how clean the room should be kept. Communicate! Again, communication is key. Talk with your roommate and set the ground rules early. Bedtimes, TV on/off times, guests and knowing what food is up for grabs are all discussions that should be had in the first couple of days. Set the foundation early so that there are no surprises or hard feelings later. Talk to your RA. That is what we are here for! We will be more than happy to sit down with you and your roommate at the beginning of the year, even if there is no conflict, just to help you set ground rules and talk about the big issues. We are a resource put in place to help you so, feel free to seek our help! Communicate! Talk to your roommate and talk early! Talk as soon as the issue comes up; don’t let feelings fester because they will only get worse. Remember your rights. University Housing has set out a set of inalienable rights that you can expect in your room; you’ll learn more about these after you move in. However, don’t forget that you are not the only one who lives in your room; your roommate has rights and opinions, too. I hope I have been able to point you in the right direction when it comes to picking a roommate. The biggest thing I can stress is to communicate! That is, without a doubt, the best thing you can do when it comes to sharing a living space. Talk to each other when selecting a roommate, when moving in and when a conflict arises. All disputes can be resolved; you just have to talk it out! Best of luck in your freshman year! Bradley Burzumato is a second-year Resident Assistant in Building 1516 majoring in History and Philosophy.